A new networking designed to connect over 8.5 million medical practitioners around the world isn't just aiming to give doctors, nurses and surgeons the ability to request an instant consultation - it's also offering students and experienced GPs alike the chance to watch in-depth medical procedures through a virtual reality headset. MDLinking, which began trialling its free service on iOS in May, was created to combine the usefulness of a messaging app with the credentials of LinkedIn and the educational potential of YouTube and has already bagged itself 4,000 registered doctors. The Dutch startup behind the app doesn't just want to offer doctors and surgeons standard video content of procedures or operations either - it wants to create a vast library of professional content viewable in VR. 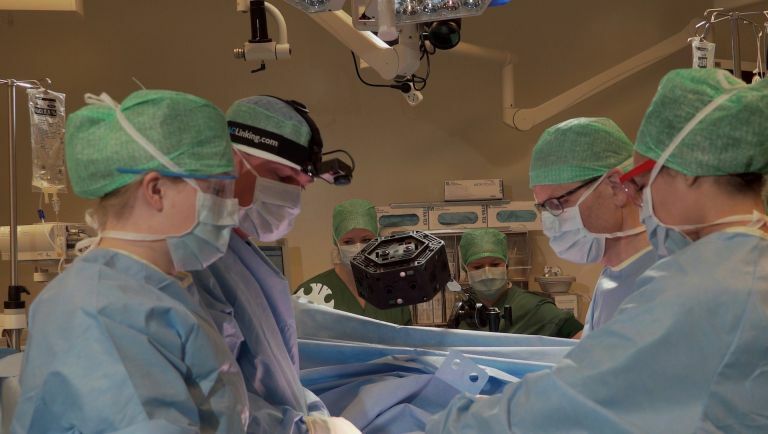 So far four operations have been conducted with a VR camera byDr Gijs van Acker, a surgeon at Medisch Centrum Haaglanden hospital in the Netherlands, thanks to a new partnership that utilises Samsung Gear headsets. Van Acker has also helped design a brand new interface for the app that enables the user to flick though different sections of the procedure at the flick of a hand - something he believes traditional teaching methods simply can't compete with. This isn't the first time we've seen virtual reality used in the operating theatre, either - back in February, we reported on a new procedure that uses bespoke VR apps to stimulate a patient's brain and enable doctors to map out its intricate network of pathways. The MDLinking app is currently in trial on iOS, with plans to launch full versions on Apple devices and Android.